Summary (from Goodreads): The year is 1929. New York is ruled by the Bright Young Things: flappers and socialites seeking thrills and chasing dreams in the anything-goes era of the Roaring Twenties. Cordelia is searching for the father she's never known, a man as infamous for his wild parties as he is for his shadowy schemes. Overnight, she enters a world more thrilling and glamorous than she ever could have imagined—and more dangerous. It's a life anyone would kill for . . . and someone will. The only person Cordelia can trust is Astrid Donal, a flapper who seems to have it all: money, looks, and the love of Cordelia's brother, Charlie. But Astrid's perfect veneer hides a score of family secrets. Across the vast lawns of Long Island, in the illicit speakeasies of Manhattan, and on the blindingly lit stages of Broadway, the three girls' fortunes will rise and fall—together and apart. From the New York Timesbestselling author of The Luxe comes an epic new series set in the dizzying last summer of the Jazz Age. My Summary: Letty and Cordelia have been friends for as long as they can remember. Stuck in the farming town of Union, both girls dream of escaping to New York, where they hope to make both of their respective dreams come true. Letty - the daughter of a strict man still mourning the loss of his wife some 8 years earlier - dreams of becoming a performer and wowing the crowd with her petite frame and big voice. Cordelia, on the other hand, dreams of finding her long-lost father: the famous bootlegger known as Darius Grey. Hours after Cordelia's frigid aunt forces her to marry a man she doesn't love, Letty and Cordelia board the train to New York, ready to forget the backwards town they left behind and start anew... but will their mutual need to escape survive the nights and lights of New York City in the roaring 20's? As stated in the prologue: "They were all marching toward their own secret fates, and long before the next decade rolled around, each would escape in her own way - one would be famous, one would be married, and one would be dead." My Thoughts: I absolutely adored this book! It was shoved down my throat recommended to me by my cousin, who loves anything and everything by Anna Godbersen. She told me what it was about, and I decided to give it a try, but I never thought I would enjoy it as much as I did! Ms. Godbersen's writing is so rich and full of wonderfully descriptive passages that you feel like you're right there with Letty, Cordelia, and Astrid as they struggle to find themselves and figure out where they belong. Without a doubt, this book is a treat - the imagery is so powerful that you feel like you've been transported back to 1929. And the storyline! There were so many twists in the plot, a little bit of mystery, a little bit of romance... it was perfect. I treasured every minute, and if you're a historical fiction lover like me, you'll definitely enjoy it as well. 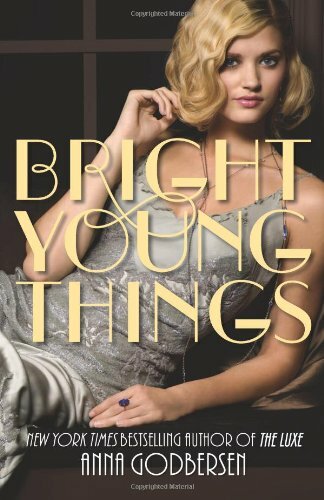 Final Thoughts: The ending of Bright Young Things leaves you demanding the sequel - I can't wait to find out what happens next with Astrid, Letty, and Cordelia - especially after that explosive ending!! Love the way you scratched out "shoved down my throat" (too funny). I've done a little of the shoving-of-books down people's throats myself. :) Great review, and I'm really excited to read Anna Godbersen's new book now. Loved her Luxe series! I adored this book as well! I started listening to it on audio, liked it so much that I went and bought it. Can't wait for the next one! Lovely review :) I haven't read any Anna Godbersen yet, but obviously I'm missing out! I loved Bright Young Things too! Anna's amazing at writing historical fiction. Glad you enjoyed it! I have this book on my tbr/wish list. I've heard great things about it. :) I can't wait to get my hands on a copy of it. Thanks so much for your review, it was very detailed!